Standard Industrial Classification Codes as set out by Statistics South Africa (Stats SA). Generally includes statistics such as value, contribution to GDP and number of employees. The most important problem or issue is usually mentioned. Provides a general outline of the industry, whether there are many players, whether there is vertical integration, whether it forms part of a larger sector, and includes the products manufactured by the industry. General value chain points, either in a paragraph or in diagrammatic form. Includes a graph showing the location of the head office of profiled companies by province. Focuses on where the dominant companies are situated and why. Provides an indication of the size of the industry. Approximate market share if it has been determined. 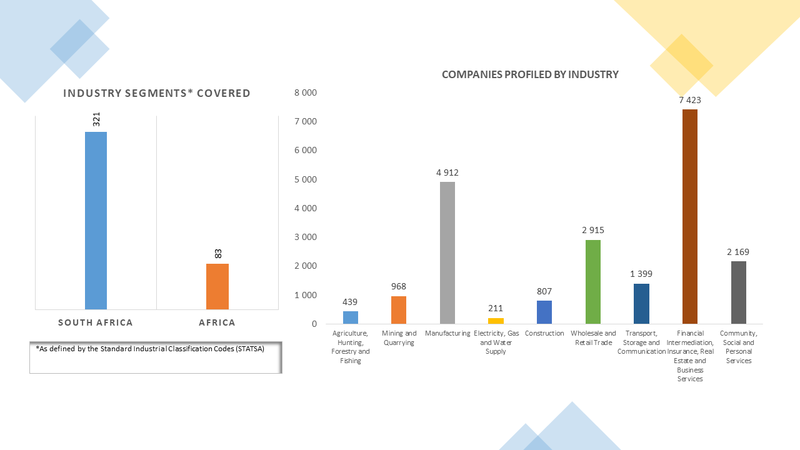 A table showing the major companies as well as smaller companies involved in the sector, arranged by province. The important events of the last year or since the last report. What is happening now? What are the trends, developments, successes, issues, government initiatives, problems? New locations and investment in capacity. Any corporate activity in the last two years. This includes takeovers, unbundling and mergers and acquisitions. Regulations that govern the industry. The charter that is applicable to the industry. Includes any BEE corporate activity. Graph showing comparative analyses of BEE Scorecard against Overall Industry Scores. Includes Opportunities for SMMEs and Entrepreneurs which identifies SMME opportunities within the sector, or supplying to the sector. Trends and/or events for the industry in Africa and the implications of these trends. 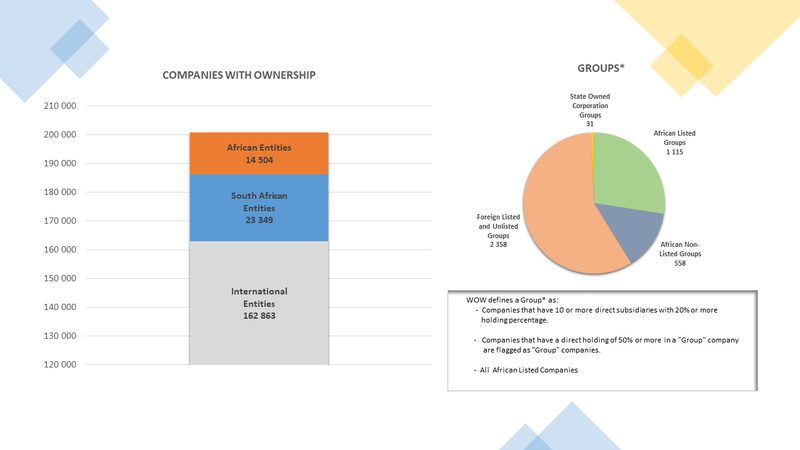 Any facts and figures re South African companies already involved in Africa. Any relevant trade/economic/political agreements and any notable developments regionally are mentioned here. Compares South Africa with the global market. Includes the names of major global players. Includes information about South African companies with a global presence. Trends, implications and market opportunities for South African companies. Factors that influence the success of the industry vary from sector to sector but the following are always included. Describes the current conditions and how they influence the sector. Includes sub-headings: Employment figures; Unions; Skills and training. Includes the SETA and training authority, skills shortages and training initiatives. Discusses any issues or developments within the sector that have resulted because of environmental concerns. The importance and effect of new technology on the sector. R&D initiatives in the sector. Other factors included could be Rising Input Costs, Cyclicality, Government Support, Legislation, Infrastructure Programmes, Rapid Urbanisation, Information Technology, etc. Includes graphs on companies profiled, employees and turnover segmented by ownership type. Local and international competition events and issues, including Competition Commission rulings and active investigations. Factors that impede entry to the industry. The SWOT analysis acts as a summary as it focuses on the Strengths, Weaknesses, Opportunities and Threats of the industry concerned. The points are drawn from the preceding content in the body of the report. Contact details for the associations that govern the industry. Names of the individuals interviewed are kept confidential. List of Publications used in the compilation of the report. List of Websites used when conducting internet research. Company information is sourced from the public domain and then verified telephonically or by email with each company on an annual basis. The database is updated daily from news and sens articles. 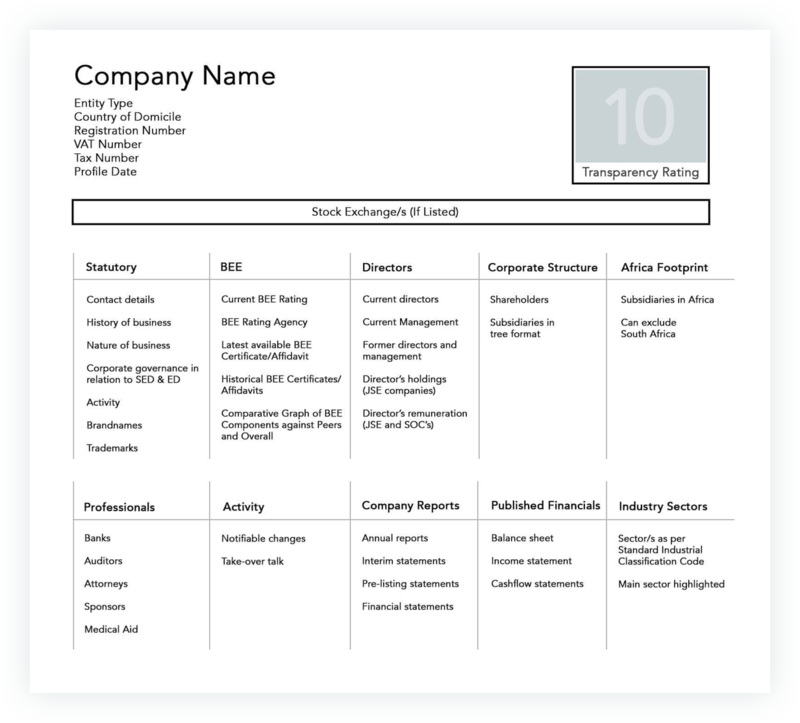 Transparency ratings are assigned to each company. Information is made available to the extent to which the company researched is willing to disclose. Not sure what a Transparency Rating is? Hover over the image to get a better understanding. in the public domain or volunteered. Information is made available to the extent to which the director/manager researched is willing to disclose. 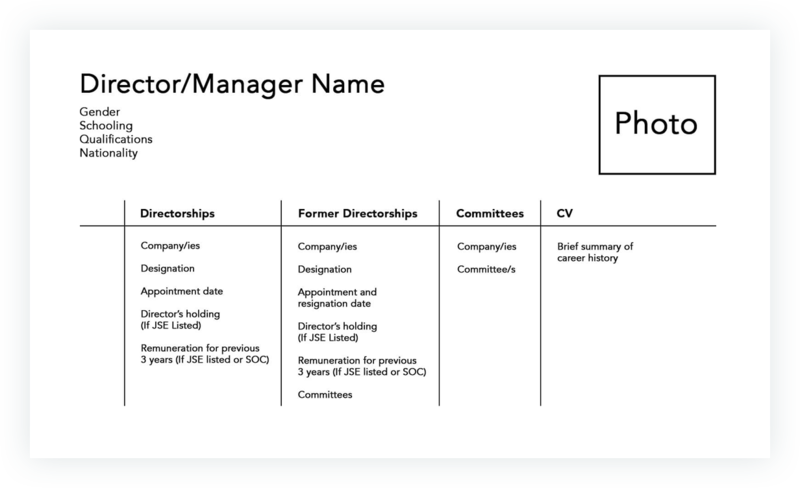 Shareholding and Subsidiary information shown in a tree structure. 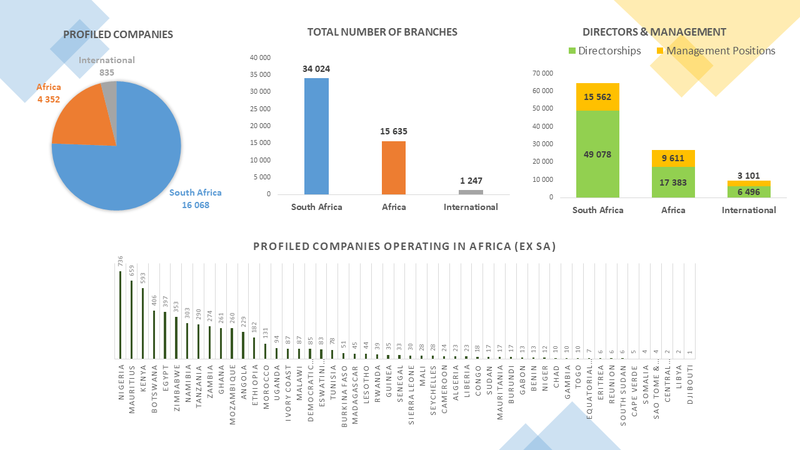 Organograms are provided for JSE Listed Companies. Groups companies to determine group exposure.